"Merhavim is Russian-Jewish band from Beer Sheva (Israel). The leader of the band—Boris Blahman is a poet, composer, musician and brilliant performer. Marina Gershman - lead vocals, Elina Milkina - violin and vocals. They perform original songs and music based on Eastern European Jewish music tradition, rich poetic Russian-Jewish culture in mixed genre of Folk/Bard/Klezmer/City Romance (Chanson). This group was founded long ago in Vitebsk (Belorussia), later they emigrated to Israel. By now they published 15 original CD's! They perform in Russian with some Yiddish elements, therefore their audience was limited in US to Russan-Jewish community. I am a friend of Merhavim and their devoted fan—so I decided to translate their songs into English. Merhavim liked the translation—Marina and Elina speak English professionally, and they decided to make it live. 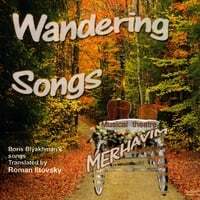 So, they published this new CD "Wandering Songs" that is in part inspired by famous novel of Sholom Aleyhem "Wandering Stars" and gives pretty broad picture of Jewish life in old Russia and Israel of today. I am an exclusive distributor of Merhavim CD's in US. Though I am not looking for commercial interest for myself,—I am trying to do whatever is possible to help Merhavim—to promote their art—to help them somehow to perform in the US. For more information, email Roman Litovsky.